Scroll down if you just want to go straight to the Common Plant Diseases Gallery. 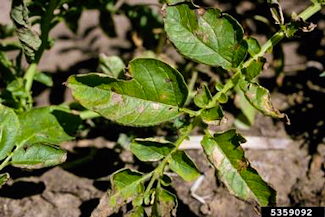 Writing about plant diseases is challenging because there are thousands of them, and what is a common plant disease in one region may be unheard of in another. In addition, some crops have more problems than others. Tomatoes and squash/cucumber family plants are the most commonly affected. 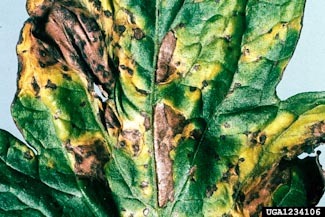 In this article on common plant diseases I will focus only on those diseases that can occur virtually everywhere when given the right conditions for growth. Most common plant diseases are caused by one of three types of organisms: fungi, bacteria, or viruses. 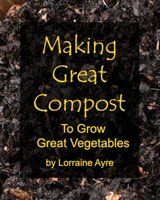 For the home gardener, and especially an organic gardener, there are limited (but not zero!) treatment options available against many of these pathogens. My standard toolbox against common plant disease consists primarily of what are called “cultural controls”, which means utilizing the Ten Organic Tools in the article Preventing Plant Diseases. "An ounce of prevention is worth a pound of cure" certainly holds true in the vegetable garden. 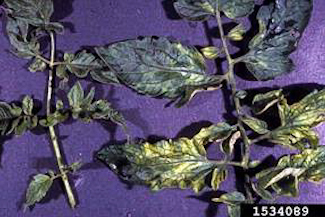 There are also some common plant “diseases” (particularly in tomatoes) that come from mineral deficiencies, inconsistent watering, or fluctuations in temperature. 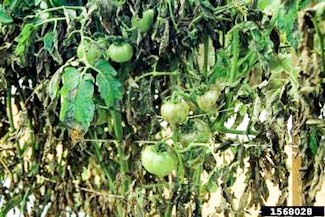 These include tomato leaf roll, blossom end rot, and catfacing, and they are covered in detail in the article on watering tomato plants. Powdery mildew is so common that I wrote a whole article just about powdery mildew. 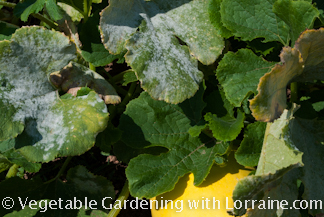 It can affect many vegetables, but the cucumber/squash/melon family seems to be particularly susceptible. It starts out as little soft gray patches, but it can soon take over whole leaves, causing them to turn almost white. Neem oil can be an effective control, but the best control of all is to keep the leaves dry, especially in hot weather, which means watering at soil level. Many people also use Bordeaux mixture as a control. Tobacco mosaic virus (Tobamovirus and its many spinoffs) is truly ubiquitous, meaning it occurs everywhere, all around the world. 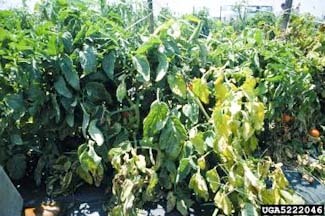 It causes the most damage in the Solanacea family of crops (tobacco/tomato/pepper/potato), but also hits beans and cucumbers. It can cause a whole range of symptoms: mottling of leaves where dark green, light green and yellow patches give a mosaic appearance, distortion of leaves from a 2D to a sort of 3D texture, wilting and general stunting. It doesn't usually kill the whole plant. Blossom end rot is caused by not enough water. The tomato starts to form, but if it doesn't get enough at the critical time, the blossom end of the tomato will die. Tomato leaf curl is caused by calcium deficiency, which believe it or not, happens when a tomato plant receives inconsistent watering. 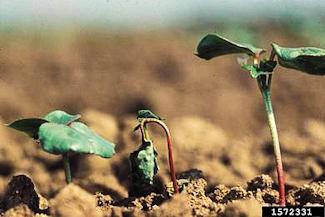 The wet-dry-wet-dry cycle disrupts the plant's ability to take up calcium, which makes the leaves curl up and get leathery. 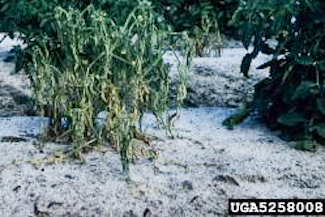 For detailed information on these and other tomato problems, visit the watering tomato plants article. If your plants are sick, the first thing I would recommend is taking a couple of close-up digital photos of the problem and emailing them to your local State University Extension Service. While they cannot make a 100% definitive diagnosis without a plant specimen to examine under a microscope (which generally costs money), they have “seen it all”, and can probably make a fairly accurate guess as to what is affecting your plant. They can also make specific recommendations for how to control the problem, though many of their suggestions may not be organic choices. Next, carefully remove the affected leaves (or even whole plants if they are badly affected) and destroy them, being careful not to touch non-affected parts or nearby plants. I carry out a disposable trash bag, put the diseased plant parts in there and carry them to the dumpster in our alley. Wash your hands and change your clothing afterward, before working again with healthy plants. And NEVER compost diseased plants, because many pathogens will survive the composting process. Neem oil can be effective against a number of fungal and viral diseases. After removing the worst-affected leaves, spray neem oil on the surrounding leaves according to the label directions.